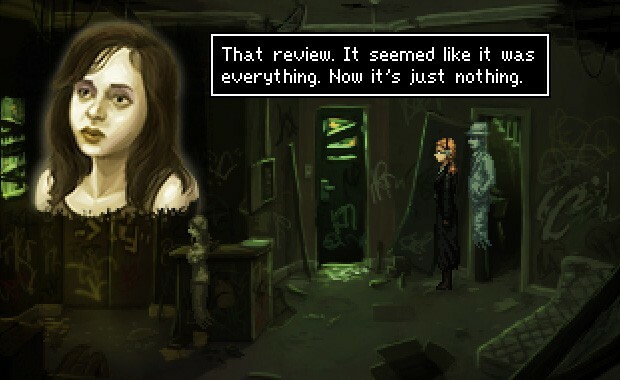 Review: The Blackwell Epiphany is " the ideal Point and Click adventure"
The point-and-click genre is probably alien to most core gamers these days. Indeed, many might assiduously say that COD is a point-and-click game. The Blackwell Epiphany seeks to please those of us who remember fondly the Monkey Island series. 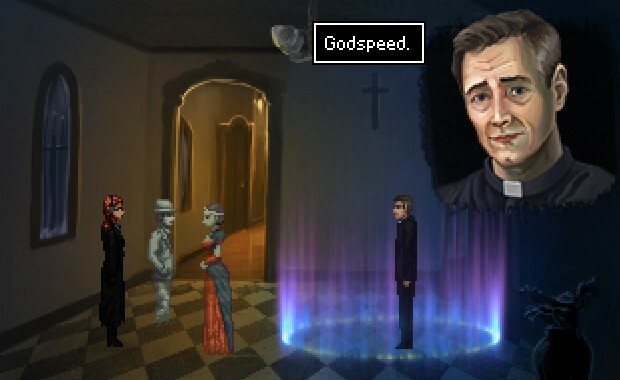 Wadjet Eye’s paranormal investigations have quietly provided a confident variation on the classic genre. 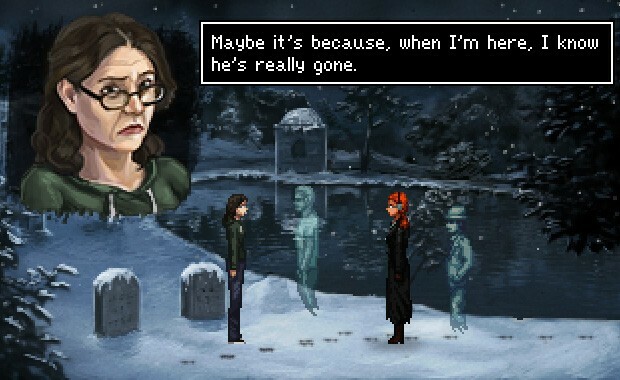 Blackwell Epiphany is an example of how, thanks to crowd-funding, the health of the genre is no longer in doubt. 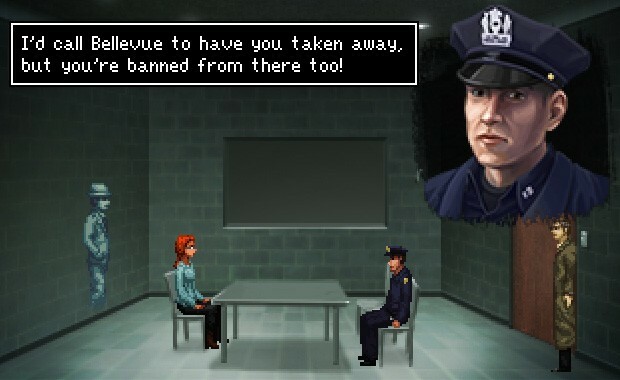 Independent developers of the future will take note of the lessons learned from Blackwell Epiphany and view it as the Platonic ideal of the point-and-click’ game. As before, you play as the psychic investigator Rosa Blackwell and her friendly ghost Joey Mallone. The start is familiar, you are tracking down a ghost to help it cross over to the other side. Then you see something new, a soul being painfully torn apart before disappearing. The duo must navigate unhelpful suspects, a wary police department and a growing list of restraining orders, while solving this spectral destruction. The ending is very tight and is a good pay off for the fans who have watched Joey and Rosa develop throughout the series. According to Rock Paper Shotgun, ” it’s pretty much the perfect ending, both wrapping up and nailing a series that’s been going from strength to strength since it first appeared way back in 2006″. One has to agree that the ending was good, but personally one finds the premise of Psychic Medium and her incorporeal wise cracking buddy rather dull. The game centers around dialogue and character interaction with objects. Progression depends on you asking the right questions or being armed with the correct knowledge. The latter is where things sometimes fall apart. One can easily misstep across the multiple paths of inquiry and interrogation and sometimes you will miss the information that is given to you. Perhaps, the reviewer is at fault because s/he was not used to running between areas to solve puzzles. Generally, gamers expect the solution to be contained in the room. The game challenges how most puzzle games have programmed us. Once you view the game as a drawn out dialogue tree requiring information to progress down certain branches things seem a lot more organic. Blackwell doesn’t make the irritating mistake found in other adventure games, where you are given far too many items at once to work with. The items you obtain are often apparent in their use and once used they disappear from the hotbar. This is a godsend for someone used to free online point and click games where the items are often obscure in their use and clutter up their inventory. In such games you may find yourself trying every possible combination that results in hours of frustration. I can think, for example, of the old Sherlock Holmes games that required you to click on everything like a madman to find a miniscule detail. The organic interaction is best shown when you obtain a code for a door by deducing it is the same as a date you view on a picture in another area. However, there are instances where you get stuck and rather than spend an hour looking and revisiting areas, you are best served looking for a walk-through. Along a similar vein, the hint mechanic was occasionally too vague or misleading. Maybe that’s a lesson about trusting your instincts and going along with hunches. Gamers should view the game play as a well knitted jumper whose threads you pull at, sometimes objectively and sometimes randomly , until it comes apart. Let’s not over extend a bad metaphor, Blackwell is well crafted with only the occasional moment whose logical progression is non-linear. While the majority of the game works surprisingly well as a standalone entity, it would be a shame if this was your jumping on point. The game continues with a form of sprite animation. The quality is noticeably stepped up, if you have played the previous games in the series. Despite improvements, some of the animations are irritating. For example, Rosa’s walk cycle is slightly clunky. I believe the team saved themselves from further criticism by taking advantage of the fact that Joey, as a ghost, has no legs. However, the upping in quality of the sprite work and animation has improved the game significantly. The game relies on one being able to read the character sprites and painted backdrops. The more detailed environments has improved interaction in this respect. One must say more about the game’s backdrops, as Epiphany does itself proud. For a low resolution game, what the developers have achieved is laudable. New series artist Ben Chandler has perfected the minimalist approach of pixel art (getting the most detail out of a finite number of pixels). It is at its best in the outside environments, displaying a beautifully detailed and lit New York city. Similarly, character portraits are impressive, although one might wish for more variation of emotion from Rosa and Joey. The voice acting is definitely not the games strongest point but it is acceptable. Sometimes there is a noticeable difference in the sound of voices which makes one think that the two audio excerpts are from different recording sessions. Sometimes the characters voices are unbearable. For example I literally couldn’t stand to listen to Madeline and skipped her dialogue sections. As an Englishman, its nauseating to hear Americans attempt to sound ye-olde-timey. However, the overall voice quality is passable and doesn’t detract from experiencing the game. The music hits the correct feeling. The jazzy theme is appropriate for the experience of trudging through the snowy streets of New York. There is some good variation for different locations, though I swear I heard an imitation of “Haddaway – What Is Love” in an a PC store manager’s office. After a while the music gets highly repetitive and I would have liked the option to turn the music off and keep the voices on so I could listen to my own playlists. The music is great, just not after four hours of hearing the same theme ad nauseam. Blackwell delivered in buckets when it came to its gameplay which was seamlessly integrated with its narrative progression. However, it lacked elsewhere; the voices were lackluster, the music grew tiresome and would’ve benefited from the option to turn it down and the hint system sometimes led me astray. The story was good as a self contained thing but comparatively one finds the premise rather weak and unengaging. I’m sure this game will speak far more to long time followers of the series than those who are just jumping on board for this installation. Worth it for fans but not for those ignorant of the series up until now.